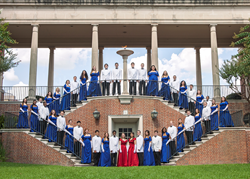 The Centenary College Choir will tour Texas from October 2-5. The choir has over 40 performances scheduled throughout Louisiana and Texas during the 2013-14 academic year. The Centenary College Choir will tour Texas from October 2-5. The choir has over 40 performances scheduled throughout Louisiana and Texas during the 2013-14 academic year. The first tour of the year will take them from the DFW area to San Antonio, and back to Fairfield, Texas. October 2: Prosper High School, Prosper, TX, 10:00 a.m.
October 3: Allen High School, Allen, TX, 11:30 a.m.
October 3: First United Methodist Church Allen, Allen, TX, 7:00 p.m.
October 4: First United Methodist Church Boerne, Boerne, TX, 7:00 p.m.
October 5: First United Methodist Church Fairfield, Fairfield, TX, 7:00 p.m. The 2014-2015 program “Out of This World,” takes the audience around the globe with cultural pieces such as Mack Wilberg’s Three Scottish Folksongs, Stephen Hatfield's rhythmic setting of the spiritual Ain’t That News, and Brad Holmes’s arrangements of Shaker Dance and the African inspired Noel. Characterizing music of the eternal and the cosmos are selections such as Dan Forrest’s arrangement of How Great Thou Art, Choir alumnus James Eakin’s We Are the Stars, and Ēriks Ešenvalds Stars, a piece accompanied by tuned water glasses. Audiences enthused over the exquisite Norwegian choral music from Disney’s recent animated movie Frozen can look forward to a set of pieces from the movie, and the Choir is even including a robust men's arrangement of Ghost Riders in the Sky in the program. Hailed as "America's Singing Ambassadors," the Centenary Choir has traveled for seven decades with a repertoire ranging from Bach to Broadway, world folk music to contemporary church music, and oratorio to opera. The Choir was organized in 1941 by Dr. A. C. "Cheesy" Voran, and has performed throughout the world, giving concerts in 32 nations on six continents. In May 2015 the Choir will tour Central Europe where they will be performing in several cities with rich musical legacies such as Leipzig, Prague, Vienna, and Salzburg. The Choir is affiliated with Centenary’s Hurley School of Music and offers scholarships for all its members. Members audition November through February for the following term. Persons wishing to audition should contact the director of the choir to arrange an appointment. For more information about the Centenary College Choir, and future tour dates, visit http://www.centenary.edu/choir. For more information about applying to Centenary College, visit http://www.centenary.edu/admission.